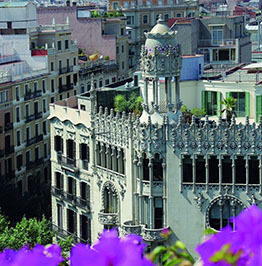 The Eixample is the Modernista (Art Nouveau) district par excellence. 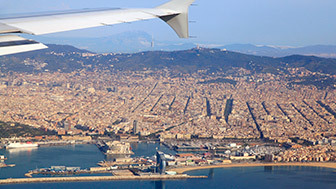 It signalled Barcelona's expansion beyond its walls at the end of the 19th century and its broad, elegant, rectilinear streets show the urban movement of the city. L'Eixample district, spread between Gran Via and Avda Diagonal, contains important avenues and boulevards, such as Passeig de Gràcia, Rambla de Catalunya and Passeig de Sant Joan; the most iconic buildings, like the Sagrada Família; the Modernisme route, with the Quadrat d’Or (Golden Square) at its heart. At the same time it is a quiet, residential district, with gardens concealed inside the blocks, schools, squares and cafe-bars, where daily life follows a pleasant routine. 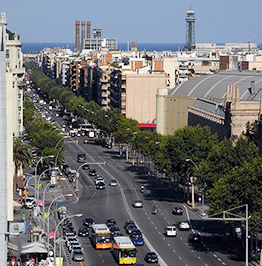 A symbol of Barcelona's opening up since its creation, l'Eixample was built in the latter part of the 19th century, following the approval of the plan put forward by the civil engineer Ildefons Cerdà. Its broad, identical streets with their characteristic octagonal blocks, have not always been here, even though it seems like it. 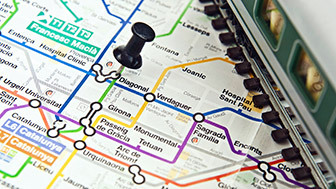 The new district arose from two necessities: one was the need to expand a Barcelona hemmed in by its walls, that could not take in any more people as industry thrived, and the other was the necessity of building roads to link the city with what were then independent towns, such as Gràcia, Sarrià and Sants. The result was this grid of precise, harmonious streets. It is divided into six neighbourhoods and each has its own character, despite the similarity of the streets. 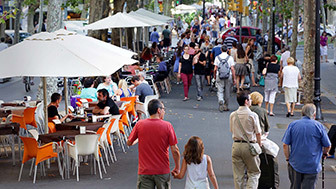 Dreta de l’Eixample, the right side of the district that starts in Plaça de Catalunya – the essential link between mediaeval Barcelona and the new city – is built around Passeig de Gràcia. It is a commercial neighbourhood that best reflects the rise of Modernisme, with buildings such as Casa Batlló and Casa Milà, otherwise known as La Pedrera, the quarry. Its commercial and tourist appeal means it is still one of the city's central hubs today. Esquerra de l’Eixample, the left-hand side, although not so showy, has other attractions. This tranquil, residential neighbourhood reaches Sants and the lower part of Montjuïc Park, and merges with Sant Antoni, one of the more unusual and popular neighbourhoods of this district today, with its marked commercial character and modern, youthful ambience. The Sagrada Família neighbourhood spreads out round the monumental church that the architect Antoni Gaudí left the city, regarded as one of the greatest architectural attractions in the world and which has given Catalan Modernisme an international dimension. Life in this neighbourhood goes on peacefully, its streets full of shops and small businesses and people who have lived there all their lives . Fort Pienc, which lies between Avda Diagonal, Plaça de les Glòries and the Arc de Triomf, is a lively neighbourhood, with avenues that are full of life and serve as a meeting point for local people, as well as ample green spaces for doing sport or relaxing in. It is also the new Chinatown, a place where the Chinese community has increasingly settled in, in recent years, opening all manner of businesses. 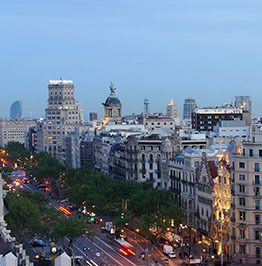 The grandeur and diversity of the Eixample invite you to have a look around, to relive the noble Barcelona of the past but also enjoy the modern, cosmopolitan city of the present. A wealth of architecture designed by Gaudí, Puig i Cadafalch and Domènech i Montaner is concentrated in the Eixample's Quadrat d’Or, or Golden Square, the heart of Modernisme in Barcelona. 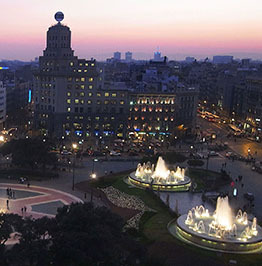 Situated right in the city centre, Plaça de Catalunya is one of Barcelona's most iconic meeting points, a vast artery with its own life where everyone comes together. 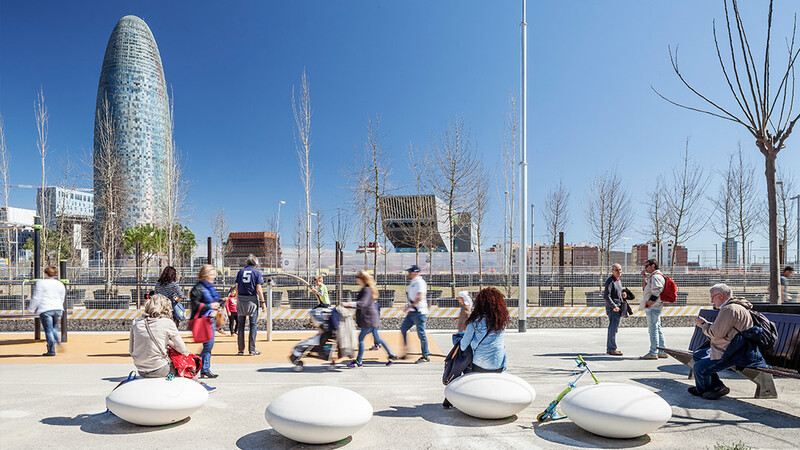 Plaça de les Glòries Catalanes is one of metropolitan Barcelona's most important hubs, the point where three of the city's main roads meet. 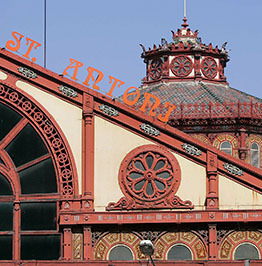 Popular, with a commercial spirit and open to new trends, the Sant Antoni neighbourhood is centred around its iconic market at one end of the Eixample district.